These metal hanging baskets, hanging cones, wall troughs and wall baskets have a classic intricate design in an elegant verdigris finish. This Victorian metal basket range have a distinctive arched wire and punched metal design for timeless style. These flower baskets are extra deep for good plant growth. This basket range comes with a Co-co quality liner and hanging chains. Comes with liner and hanging chains. 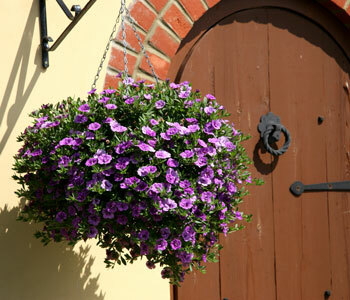 This hanging basket bracket is designed for the victorian hanging baskets. Holds a 25cm (10") Pot.